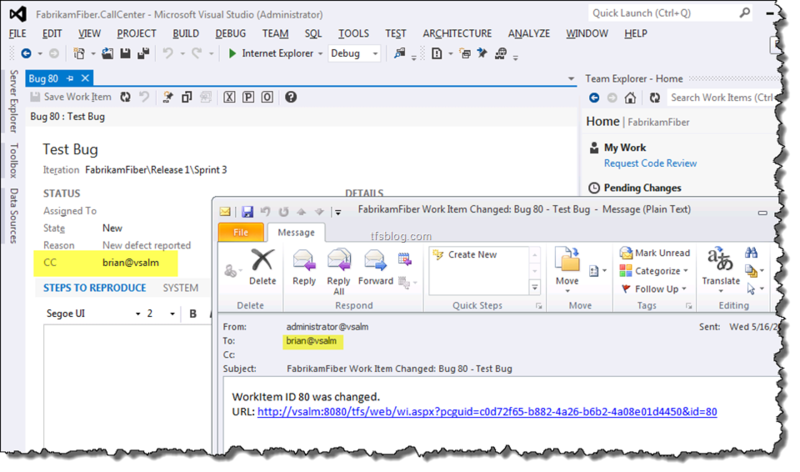 In TFS you can set up Project Alerts that alert users when work items change. But sometimes you would like to be able to add a list of people to be notified when a particular work item changes. You can achieve this by using a server-side plug-in. Download the .ZIP package with all event-handlers for TFS 2018 here (for TFS 2017 here, for TFS 2015.1 or higher, you can find it here and for TFS 2013, here). Done. When you enter user names (or e-mail addresses) into the new field (separate multiple values with commas or semicolons), those users will be notified of any changes that happen to that particular work item. 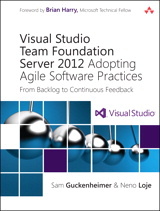 Note: Server-side plug-ins work on TFS on-premises only (not with Visual Studio Online Team System). Update (February 23, 2016): Added link to TFS 2015.1-compatible .ZIP file. Update (June 6, 2017): Added link to TFS 2017-compatbile .ZIP file and changed “Visual Studio Online” to “Visual Studio Team System”. Update (July 19, 2018): Added download link to TFS 2018-compatbile version, and fixed the link for the TFS 2017 version. I’m not in any way complaining, The CcNotifications plugin worked great for me from day one. It does look like TFS 2013.2 has broken it. Is the source code available so I can adjust for 2013.2? This is what we are looking for. Currently we just added our entire organization to our team and use a Team Alert for State Change and send it to the Created By field (not optimal as we lose functionality due to performance; 20 Minutes to get the capacity screen on the Task Board 🙁 ). How easy would it be to use change the plugin to use the CreatedBy field instead of ( or as well as) the ccNotificationReceivers on State Change only? That way we would not need to add the person we want to notify manually. We would also like to restrict it by work item type, e.g., “Product Backlog Item” and Team Project(s). @Michael: In TFS, you can already set up an alerts that would inform the creator of a work item when it has been changed by somebody else. Let me know, if that works for you. I was wondering if the solution would support adding specific fields to the alert generated. Obviously not as is. Can you suggest a new class? What fields would you like to see in the alert generated? Would it be the same fields as with the normal work item alerts? Will this dll work for TFS 2012? If not, anyone know if one exists for TFS 2012. Thank you! Unfortunately, the CcNotifications server plug-in has never been released for TFS 2012 (it supported TFS 2013 when I first published it). As TFS 2012 is more than 5 years old, I don’t see a huge value in backporting it. If it’s very urgent for your company I would happily reconsider though. 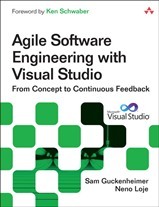 Is there anything particular stopping you from upgrading to a more recent version of TFS?